"Breaks just about every rule in the book and makes us beg for more." --RT Book Reviews on Jo Beverley. Mary Jo Putney is a New York Times and USA Today bestselling author who has written over 60 novels and novellas. A ten-time finalist for the Romance Writers of America RITA, she has won the honor twice and is on the RWA Honor Roll for bestselling authors. In 2013 she was awarded the RWA Nora Roberts Lifetime Achievement Award. Though most of her books have been historical romance, she has also published contemporary romances, historical fantasy, and young adult paranormal historicals. She lives in Maryland with her nearest and dearest, both two and four footed. Visit her at maryjoputney.com Joanna Bourne is the author of The Spymaster's Lady and My Lord and Spymaster, and the coauthor, with Mary Jo Putney, Jo Beverley, Patricia Rice, Nicola Cornick, Cara Elliott, Anne Gracie, and Susan King, of The Last Chance Christmas Ball. Together, these authors are the ladies otherwise known as the Word Wenches. They have written a combined 231 novels and 74 novellas. They've won awards such as the RITA Award, RT Career Achievement award, RT Living Legend, and RT Reviewers' Choice award. Several of them are regulars on the New York Times and USA Today bestseller lists. Learn more at www.wordwenches.com. The author of more than twenty romances, Patricia Rice was born in Newburgh, New York, and attended the University of Kentucky. She has two grown children, and lives with her husband of many years in Charlotte, North Carolina. 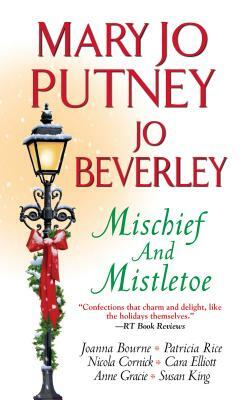 Jo Beverley is widely regarded as one of the most talented romance writers today. She is a four-time winner of Romance Writers of America's cherished RITA Award and one of only a handful of members in the RITA Hall of Fame. She has also recieved the Romantic Times Career Achievement Award. Born in England, she now lives with her husband and two sons in Victoria, British Columbia, just a ferry ride away from Seattle, WA.